From the very start, you know that there’s something different about The Sparrow, and that goes for both the play currently on stage at Stoneham Theatre and the title character. The Sparrow is an inventive and original play that combines a comic book aesthetic and a cinematic style – achieving a result that is artistic yet accessible and approachable. The play was conceived by Nathan Allen, who directed the original production at the House Theatre in Chicago. Allen also directs the Stoneham production. The Sparrow tells the story of a brooding teenager named Emily Book (played by Dillan Arrick) who returns home for her senior year of high school. Emily had been sent away as a young child to attend a private boarding school following a tragedy that traumatized the entire town. The details are gradually revealed over the course of the play, and to say more here would risk letting a spoiler slip. Suffice it to say, Emily returns to town with telekinetic powers that prove to be both a blessing and a curse. While the townspeople initially have mixed feelings about Emily’s return, they ultimately welcome her. But from the moment of her return, Emily is filled with trepidation. “I don’t know how to be here,” she admits, and through much of the play, Arrick as Emily carries herself in a tense slightly hunched posture with a pained expression on her face. She’s the quintessential bright, moody teenage girl. Jenny (Elizabeth Erwin) is the perky blond head cheerleader and honor student who attempts to take Emily under her wing, and tries to get her to come out of her shell. “You could be a cheerleader!” Jenny encourages Emily. “I’m not very cheery,” is Emily’s understated reply. The play employs some inventive techniques to convey the feeling of movement and imaginative space. When Emily is traveling home by train, the effect of the passing landscape is created by the other twelve actors walking past Emily’s seat, carrying framed pictures of scenery. The set is simple, with classroom chairs, school locker panels and other set pieces carried on and off the stage as needed by the actors. Huge panels depicting blue sky and clouds line the walls of the auditorium further suggesting the idea of flying. A unique, movement-based play, The Sparrow is a worthwhile theatrical experience that will appeal to adults and high school-age students. A play like The Sparrow runs the risk of being self-consciously artistic. But director Nathan Allen achieves a balance between the play’s artistic elements and its linear story that prevents The Sparrow from flying off course. 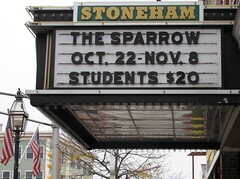 The Sparrow runs through Nov. 8 at Stoneham Theatre, 395 Main St., Stoneham. For show times and tickets go online at http://www.stonehamtheatre.org or phone 781-279-2200.